Sustainable fashion using repurposed materials was the key to last night's StyleWeek Seedlings Student Design Challenge. What do safety pins, plastic bags, bubble wrap, wallpaper and “For Rent” signs all have in common? They are a list of materials that were used to create sustainable fashion in last night’s StyleWeek Seedlings Student Design Challenge. Seven young designers from the Lincoln School in Providence had the chance to spotlight their craftsmanship and creativity influenced by the school’s STEAM hub program: Science, technology, engineering, arts and mathematics. The designs were positively critiqued by a live panel of judges, who highlighted the resourceful and innovative talents of the young women. 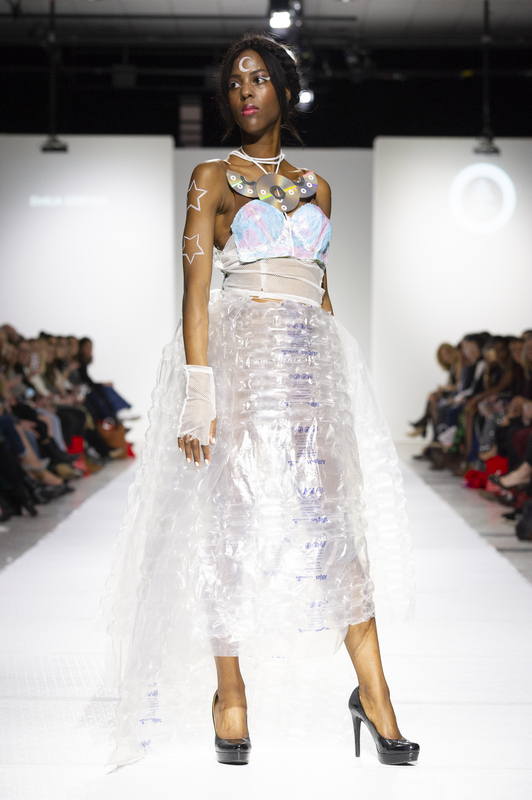 The first garment to head down the runway was created by Lincoln School student London Cambra, who repurposed plastic shopping bags into a tea-length gown with a full skirt blooming with layers of shopping bags. 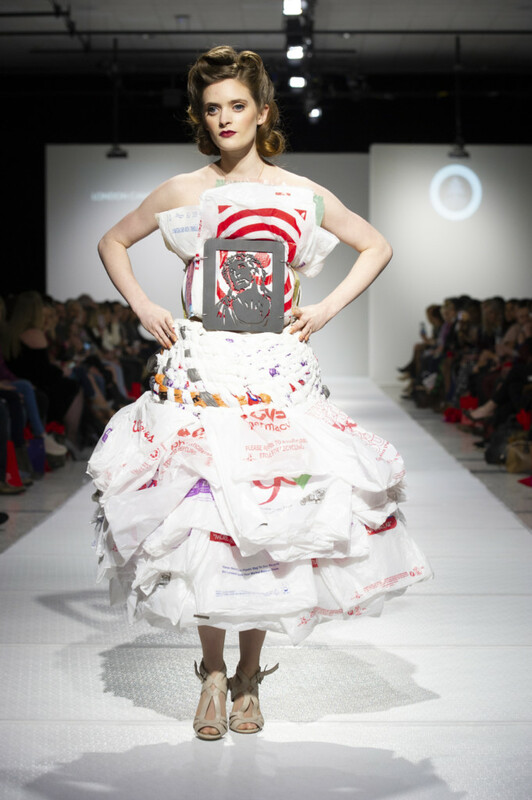 Cambra constructed the bodice by weaving the bags together in a criss-cross design, with the target symbol from a Target bag serving as a focal point of the dress. London Cambra’s Design repurposed plastic shopping bags. Photos by Myke Yeager. Katherine Chambers created a beautiful asymmetrical dress that included a bodice of prisms made from broken compact discs, and a skirt assembled from cut pieces of maps. It’s truly a work of art that would turn heads at a red carpet event. 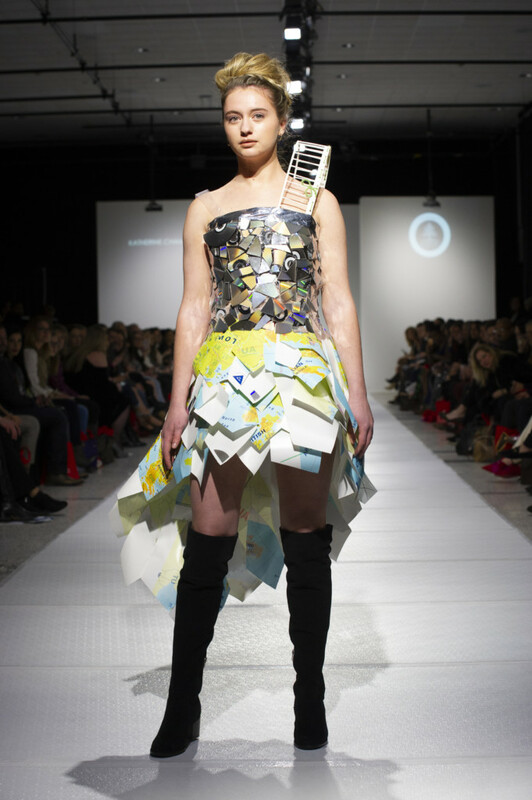 Katherine Chambers’ design used shards from compact discs and sections of old maps. Photos by Myke Yeager. Emilia Derego collected big sheets of plastic bubble wrap to create the full skirt of her ethereal and futuristic gown. The sheer design resembled otherworldly fashion with compact discs serving as a neckpiece for the gown. Emilia Derego’s gown was made from plastic bubble wrap. Photos by Myke Yeager. Maeve McEnroe turned heads on the runway with a two-piece design that would suit 1990’s Madonna. The black gown with chain webbing was constructed out of black trash bags and chains strung together using countless safety pins. The amount of time and effort that went into constructing this spider web-like piece is incredible. Maeve McEnroe’s two-piece garment was made using trash bags and chains of safety pins. Photos by Myke Yeager. Elizabeth Wein’s design made both fashionable and feminist statements. 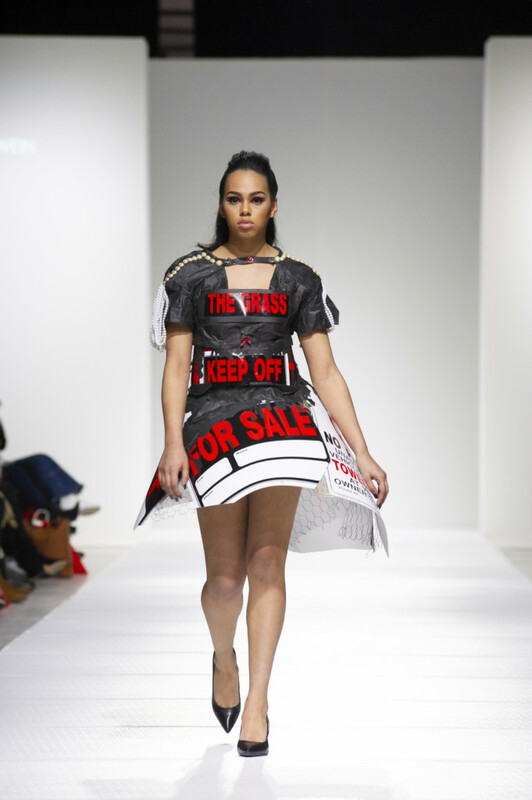 The garment, created out of “For Rent,” “For Sale,” and “Keep off the grass,” signs was actually a statement on the objectification of women’s bodies and the “Me Too” movement. What a creative way to turn attention to an important issue! Elizabeth Wein’s dress was a statement on the objectification of women’s bodies. Photos by Myke Yeager. Emily Weintraub’s dress seemed to be made of a metallic tarp-like material or heavy plastic sheeting used to cover large items. She constructed a two-piece look including a halter top with hardware and a neckline strung together with safety pins paired with an asymmetrical high-low skirt. Emily Weintraub’s look was made from repurposed plastic sheeting. Photos by Myke Yeager. Lastly, Sophie Weiting closed the show with a daring dress made with wallpaper-embellished cardboard. She cut small triangles using the materials and held them together in a sharp-angled skirt with points. The judges deemed Weiting the winner of the competition and she went home with a scholarship that she will use to fund her education. Sophie Weiting’s winning design was constructed from wallpaper-embossed cardboard. Photos by Myke Yeager. 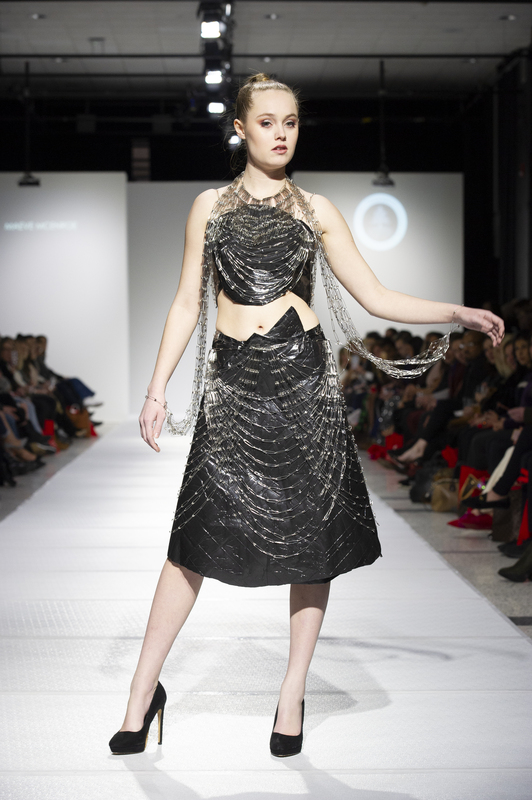 Following the Seedlings Student Design Challenge, Boston-based designer Cotey Bertone showcased his work on the runway. 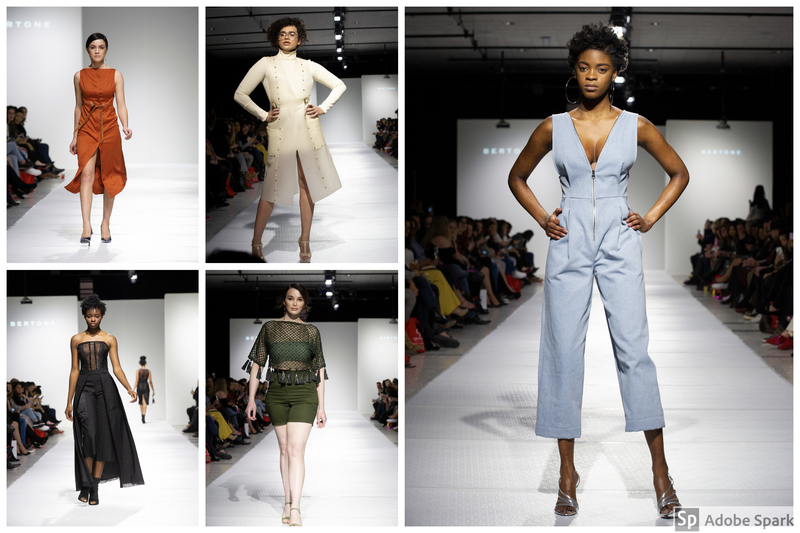 The garments featured a minimal, clean-cut aesthetic in a neutral palette. Outfits included a chunky white sweater layered with a rubber-like sleeveless coat, black sheer knee-length dresses and lightweight midi dresses in warm hues like burnt orange and deep tans accented by high slits. Bertone’s designs also featured ocean blues and earth-toned army green casual wear including shorts paired with a sheer tasseled top, plus a versatile light blue, v-neck jumpsuit, perfect for a mid-day stroll or a night on the town. Designs by Cotey Bertone. Photos by Myke Yeager. The last show featured Amy Lane Designs (AMLN), highlighting garments made from vintage accessories and repurposed fabrics. 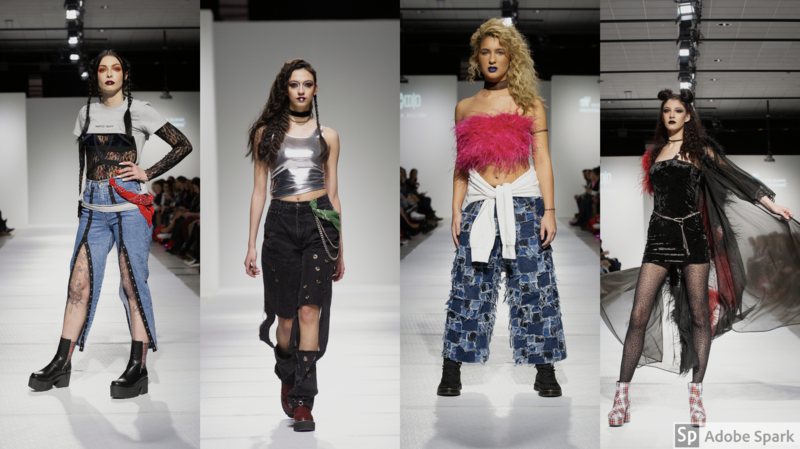 The designs took us from grunge to goth to ‘90s fashion. Many outfits that made their way down the runway included ripped flared jeans paired with metallic tank tops and silver chains, while others consisted of bright pink and green furry tube tops and miniskirts over fishnet stockings. Most outfits were also paired with platform grunge boots and black chokers, plus dark lipstick and heavy eye makeup. Amy Lane Designs. Photos by Myke Yeager.